A nationwide stay of Trump’s travel ban was upheld Thursday by a panel of three federal judges, effectively blocking the enforcement of Trump’s ban on immigrants from seven majority-Muslim countries as well as refugees from all over the world. “3-0″ marks the unanimous opinion of the three federal judges. Clinton’s simple message of support stood in stark contrast to Trump’s own reaction to the news. 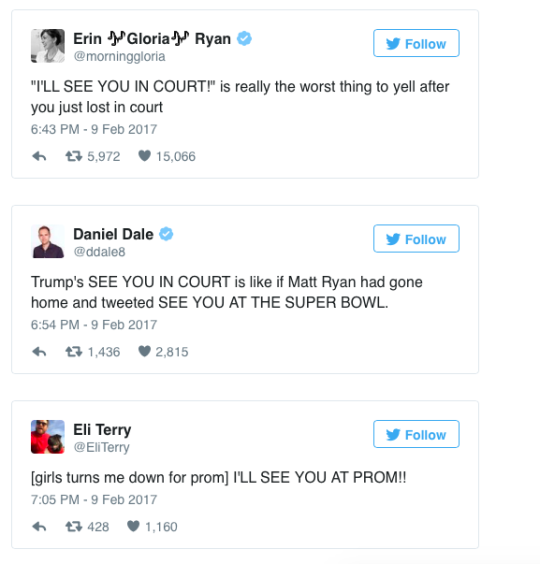 Twitter users didn’t hesitate to point out the irony of Trump’s message: After all, he had, in essence, just been in court. And lost.